Bubblelands is Renee Liang’s third new work this year, and unlike Under the Same Moon and The Two Farting Sisters, this theatrical appetiser takes some big risks in unchartered waters. Liang’s repertoire has reflected the unique perspectives of Chinese New Zealanders from a variety of different positions as questions of identity and belonging are questioned, negotiated and navigated. Bubblelands drifts away from this sphere and offers a novel attempt at re-locating and re-defining what could be mainstream theatrical fare for New Zealand audiences. The plot is simple enough: a rather bawdy crayfish with a penchant for rapping to Psy and Soulja Boy meets an OCD blue cod in a fish tank in a Chinese restaurant. 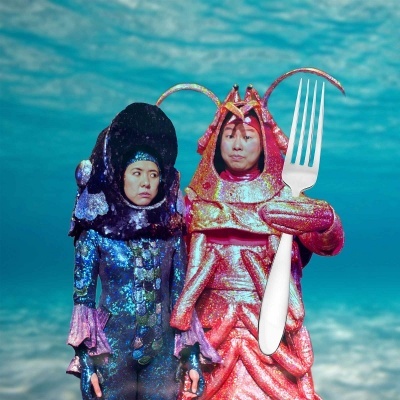 The play’s advertising promises a “fable of fishy sentience, ecology and sashimi” and while it doesn’t quite deliver that, what we do have is an extroverted street-smart crustacean whose humour, wit and charm offer some relief to our poor endemic marine fish who is suffering an existential crisis. Benjamin Teh steals the show with his beat-boxing, personalised sound effects and slick dance moves and could quite easily pull off a solo crustacean cabaret. Liang has written this role for Teh and it’s clear he’s having an absolute blast while he cavorts around the stage driving his fellow tank-mate to distraction. Unfortunately, this is done at the expense of Blue Cod. Hweiling Ow’s anxiety-riddled character oscillates between repulsion for unidentified liquids and an unwavering faith in ‘the people’ and a greater purpose. Together theirs could be the ultimate fishy friendship and yet, despite the unequivocal talent on display, the work falls frustratingly short. Beckett-esque in set-up and style, Bubblelands promises an absurdist drama or at least satirical commentary. That potential does exist, in fact it floats to the surface at least twice, yet the despair, the suffering and the tensions of being caught in cycle of waiting, and still waiting, are glossed over. It’s also easy to get distracted because Teh and Ow are excellent performers who work hard to expand their characters but whether flesh, fish or fowl, these two personas are floundering in a narrative that, in its current iteration, has no substantial core. Liang has offered us a theatrical titbit. This is a savoury starter which at under an hour is still a long way off morphing into a satisfying feast. Director Amanda Grace Leo has been supported by well-known figures including Beth Kayes and Borni Te Rongopai Tukiwaho and her directorial debut has created a space that offers a promise to change the narrative – not just of bucking stereotypes but also arguing for different narratives. While this is laudable, again there is much work to be done to invigorate this work with a clear sense of purpose that goes beyond this conceptual frame and can bring to the fore the multiple layers that are potentially still untapped. Various meandering narratives, issues of timing and pacing, the imbalance of the different power-relationships, are teething problems with a play that seems to have been rushed to the stage. There are certain comic elements that work very well but as a comedy (or even as a pastiche of a tragicomedy) the play turns upon itself to reveal very little take away. However, and this is no exaggeration, the costumes are brilliant. Sarah Burren has created some of the most fabulous under water costumes to grace the stage at the Basement. Her incredible attention to detail, style and colour, to create these larger-than-life outfits, are one of the highlights of the work. With a strong and talented team behind it Bubblelands will surely rise to the surface, it just needs to take it’s time. Copyright © 2019 dione joseph. All Rights Reserved.